Vibration plates are still popular because of their profound benefits on your body, but most importantly, your body fat. Used in conjunction with other forms of exercise and a healthy eating plan you can enjoy all the Lanaform Luxury Vibrating plate has to offer you. How does it work? 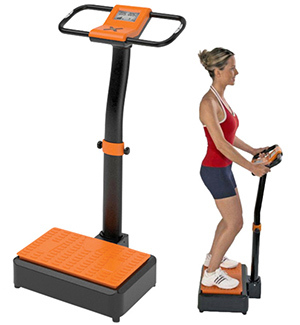 As you stand on the Luxury Up & Down platform, it generates oscillations of variable amplitudes, working and toning the muscles of your body and removing excess fat. Your whole muscle system gets a great work out and you can really feel it working! The vibrations stimulate the receptors in your muscles (muscle spindles) which cause them to work harder. Coupled with the performance of an exercise such as a push up or squat, more muscle fibres are recruited and fatigued. Therefore, more muscle fibres are activated and trained. After a workout it is also highly beneficial – you can use it to help stretch off your tired muscles so that you end your workout feeling refreshed and rejuvenated, not sore and tight. Try it on your calves or hamstrings after a leg session. Muscular micro-contractions promote heat production in your muscles and skin. This effect helps to use up calories and burn off fat and cellulite. It boasts a sleek design so it will look smart and tidy wherever you choose to store it. Whether you want to use the Lanaform Up & Down to ease muscular tension or you want to help tone up your physique and burn that stubborn body fat, then this machine is for you. Take that first step to your new body and new you!